It’s a tube-powered audio interface with amp modelling technology. Audient has teamed up with Two Notes on a guitar-centric interface: the Sono. This “amp modelling audio interface”, as Audient dubs it, combines the brand’s acclaimed analogue-to-digital conversion technology with boutique amp and speaker cab emulations taken from Two Notes’ Torpedo. When your guitar is plugged in, its signal runs through a preamp section, which consists of a built-in 12AX7 tube and a three-band tone control. The signal is then routed to the Torpedo’s power amp modelling and cab sim section, where you’ll find emulations – like vintage Fenders and Marshalls – to choose from. Using the Torpedo’s desktop app, you can edit how each cab sim is mic’d up, and simulate various room types. 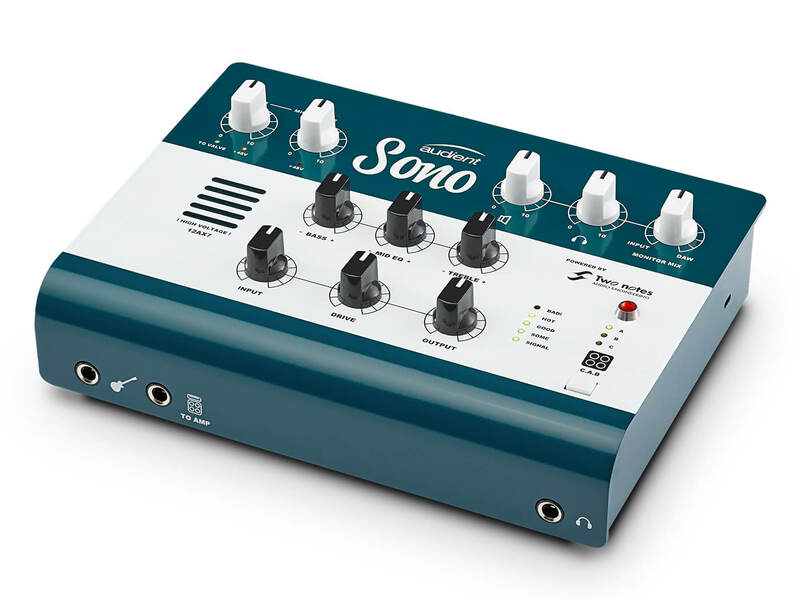 The Sono lets you store up to three presets, so you can even take these three ‘amps’ to the stage. Should you need an expanded rig, the Sono has also got you covered with a suite of downloadable cab sims. The Sono, which connects to your computer via USB-C, can handle a total of 10 ins and four outs with ADAT expansion. These I/Os include a guitar input, mono output and headphone out on the front panel, and two 1/4-inch/XLR inputs (with Audient’s mic preamps) and a stereo line output on the back. Available in the first quarter of 2019 at $449. More information at audient.com.